Asymmetric routing is not a problem by itself, but will cause problems when Network Address Translation (NAT) or firewalls are used in the routed path. For example, in firewalls, state information is built when the packets flow from a higher security domain to a lower security domain. The firewall will be an exit point from one security domain to the other. If the return path passes through another firewall, the packet will not be allowed to traverse the firewall from the lower to higher security domain because the firewall in the return path will not have any state information. Another problem than can occur is unicast flooding where the cause of flooding is that destination MAC address of the packet is not in the L2 forwarding table of the switch. ARP: Maps an IP address to a MAC address in order to provide IP communication within a Layer 2 broadcast domain. For example, Host B wants to send information to Host A but does not have the MAC address of Host A in its ARP cache. Host B generates a broadcast message for all hosts within the broadcast domain to obtain the MAC address associated with the IP address of Host A. All hosts within the broadcast domain receive the ARP request, and only Host A responds with its MAC address. CAM: As frames arrive on switch ports, the source MAC addresses are learned and recorded in the CAM table. The port of arrival and the VLAN are both recorded in the table, along with a timestamp. If a MAC address learned on one switch port has moved to a different port, the MAC address and timestamp are recorded for the most recent arrival port. Then, the previous entry is deleted. If a MAC address is found already present in the table for the correct arrival port, only its timestamp is updated. Ternary Content Addressable Memory (TCAM) – Not required to understand the unicast flooding behavior. Remember: In L3 Switches, the default ARP table aging time is 4 hours while the CAM holds the entries for only 5 minutes. Suppose to have a client that wants to download a file from a FTP server. The client has the IP address 10.0.0.100 and it is connected to Ciscozine1 L3Switch which is the default gateway for the Vlan 100 (10.0.0.1). On the other end, there is an FTP server (192.168.0.200) which is connected to Ciscozine2 L3Switch. Ciscozine2 is the default gateway for the Vlan 200 (192.168.0.1). There are other clients connected to Ciscozine2 on to the Vlan 100 and a server connected to Ciscozine1 on the Vlan200. Ciscozine1 has defined a Vlan200 interface with 192.168.0.2 ip address, while Ciscozine2 has defined a Vlan100 interface with 10.0.0.2 ip address. Suppose that the FTP client is already connected to the FTP server; this means that the CAM and ARP table of the L3 switches contain the information (IP and Mac address) about the FTP Client and FTP server. So what happen if the FTP Client wants download a large file? 1. The FTP client sends the ftp request to to its default gateway (Ciscozine1 – 10.0.0.1). 2-3. The Ciscozine1 checks the destination address (192.168.0.200) in the routing table and forwards the packet to the Vlan200 interface. 4-5. Ciscozine1 forwards the packet to Ciscozine2 which delivers the FTP request to the FTP Server. 6. The FTP server starts to send the file (requested by the FTP Client) to its default gateway (Ciscozine2 – 192.168.0.1). 7-8. The Ciscozine2 checks the destination address (10.0.0.100) in the routing table and forwards the packet to the Vlan100 interface. 9-10. Ciscozine2 forwards the packet to Ciscozine1 which delivers the packet to the FTP Client. After 5 minutes, the two Layer3 switches remove the FTP Client and FTP Server mac address entries from the CAM, so what happens when the MAC Address table ages out and the FTP client wants download other files? 11. The FTP client sends the ftp request to to its default gateway (Ciscozine1 – 10.0.0.1). 12-13-14. The Ciscozine1 checks the destination address (192.168.0.200) in the routing table and forwards the packet to the Vlan200 interface, but the CAM does not contain the FTP Server MAC Address, so Ciscozine1 floods the packets to all Vlan 200 interface (for instance to the server connected to Ciscozine1)! 15. Ciscozine2 delivers the FTP request to the FTP Server. 16. The FTP server starts to send the files to to its default gateway (Ciscozine2 – 192.168.0.1). 17-18-19. The Ciscozine2 checks the destination address (10.0.0.100) in the routing table and forwards the packet to the Vlan100 interface, but the CAM does not contain the FTP Client MAC Address, so Ciscozine2 floods the packets to all Vlan 100 interface (for instance to the Client connected to Ciscozine2)! 20. Ciscozine1 delivers the packet to the FTP Client. Note: The result is that packets of the data transfer between the FTP Client and the FTP Server will mostly be flooded to Vlan 100 on Ciscozine2 and to Vlan200 on Ciscozine1. This means every connected port in Vlan 100 on Ciscozine2 and in Vlan200 on Ciscozine1 will receive all packets of conversation between 10.0.0.100 and 192.168.0.200. This will cause a complete connectivity outage to the hosts or slow them down considerably. This flooding is due to asymmetric routing and may stop when the arp table is age out or the Switch sends a broadcast packet (for istance an ARP request). What happens if the ARP table entries in the two L3Switches are age out? 21. The FTP client asks to download the file the the FTP Server and it sends to the default gateway (Ciscozine1 – 10.0.0.1). 22-23-24. 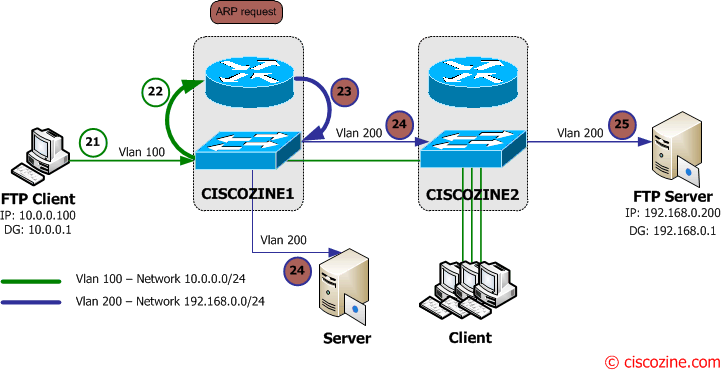 The Ciscozine1 checks the destination address (192.168.0.200) in the routing table; then it notices that there is no arp entry for the 192.168.0.200 hosts, so the L3Switch sends an ARP request (a broadcast message to the Vlan200 network) to ask “who has 192.168.0.200?”. 25. 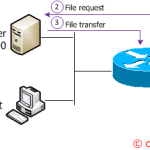 The FTP server receives the ARP request. 26-27. The FTP server sends an ARP reply to Ciscozine2 which forwards it to Ciscozine1. 28. The Ciscozine1 updates the arp and CAM table, so the unicast flooding on the Vlan200 stops and the FTP Client packet is sent to the FTP Server (like previous 3-4-5 steps). 29. The FTP Server starts to send the file to the FTP Client using its default gateway (Ciscozine2 – 192.168.0.1). 30-31-32. The Ciscozine2 checks the destination address (10.0.0.100) in the routing table; then it notices that there is no arp entry for the 10.0.0.100 hosts, so the L3Switch sends an ARP request (a broadcast message to the Vlan100 network) to ask “who has 10.0.0.100?”. 33. The FTP Client receives the ARP request. 34-35. The FTP client sends an ARP reply to Ciscozine1 which forwards it to Ciscozine2. 36. The Ciscozine2 updates the arp and CAM table, so the unicast flooding on the Vlan100 stops and the FTP Server packet is sent to the FTP Server (like previous 8-9-10 steps). An easy approach is normally to bring the ARP timeout and the forwarding table-aging time close to each other to limit the length of unicast flooding. This will cause the ARP packets to be broadcast. Relearning must occur before the L2 forwarding table entry ages out (not discussed in this article). Another approach is to use the unicast blocking feautere (not discussed in this article). A better approach is to implement the network with HSRP. In this case Ciscozine1 is the active router while Ciscozine2 is the standby router. 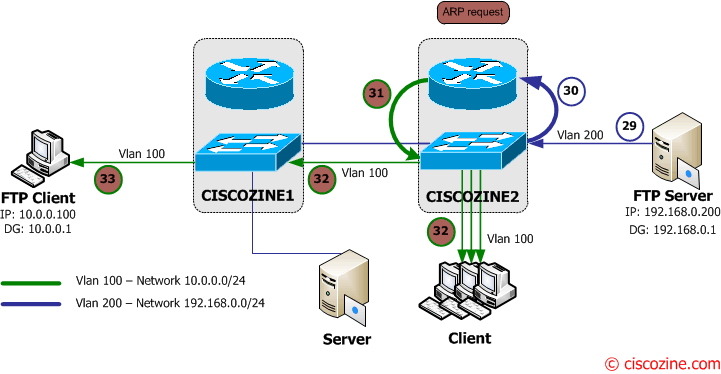 With this configuration Ciscozine1 acts as router and switch while Ciscozine2 acts as a switch; the packets sent and received by the FTP Client will use the same path (1-2-3-4-5 and 6-7-8-9-10) because there isn’t asymmetric routing. So during a file transfer the mac address table can not age out because the CAM timestmap is continuously updated. For this reason the unicast flooding can not occur. Note: You can also simulate this behavior using a router plus a switch instead of a layer3 switch. Asymmetric routing is a situation where a packet traverses from a source to a destination in one path and takes a different path when it returns to the source.